Mansarda Raggio di Sole i Verona, Italien : Boka nu! Mansarda Raggio di Sole is situated in a private apartment with elevator, on the fourth floor of a building along the Venetian Walls of Verona. 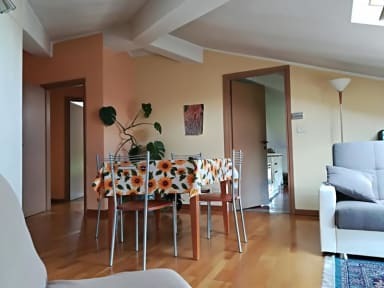 The B&b is near the historical center of Verona and close to all major city sites and monuments, 1km away from the central square of the city, Piazza Bra, where you can find the world famous Roman Theater Arena, and 400m from Juliet's tomb, where many people get married. The Mansarda is the ideal place in order to perform a complete visit in Verona and its neighborhood , because of its strategic position. From the B&B is extremely easy to reach Verona Fair, the railway station, and public transports which link Verona with Garda Lake and wine and mountain locations. 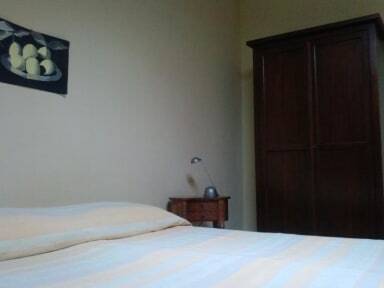 Raggio di Sole B&B has got two double bedrooms; one bathroom with shower; spacious lounge and kitchen with microwave, kettle for tea and coffee machine for breakfast. Everything in a nice and characteristic environment typical of a mansard. Cancellations 24 hours before arrival. Check in from 1pm till 10pm. Guests will be accepted after that time, only after previous agreement, and 10 euros will be added to the balance due to the B&b . Payment in cash upon arrival. Tourist tax : 2,5 euro per person for maximum 5 nights of staying. When booking you must indicate an estimated time of arrival; please be as precise as possible, so we will not keep you waiting for a long time. Please text us as soon as you know - at the mobile number you will find in your reservation confirmation - if changes in your estimated arrival time have occurred. Rekomenderar verkligen! Bra mottagande av en jättetrevlig värd. Lägenheten var rymlig och bra, det mesta som kan tänkas behövas fanns där. Vi fick också en superbra frukost ned ägg, bröd och yoghurt (att laga själva), mycket bra. Enda saken att notera är att lägenheten är en vindsvåning och kan bli väldigt varmt, men det fanns en fläkt i rummen iallafall.